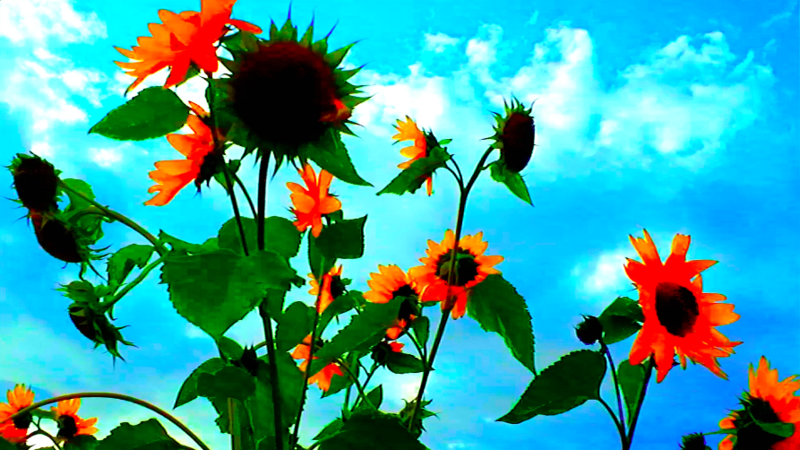 Almost two minutes into Jean-Luc Godard’s Adieu au langage (Goodbye to Language , 2014), there is a low angle shot looking up at some bright sunflowers followed by a shot of a summer sky, the clouds dusted pink and gold. 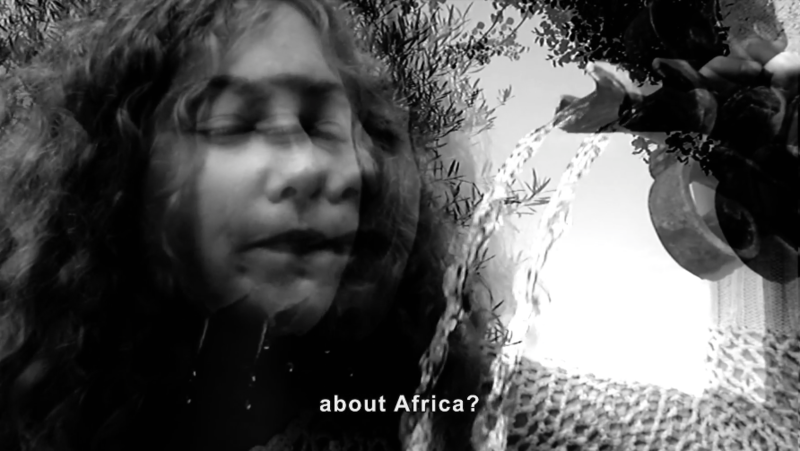 A woman’s voice asks, “Sir, is it possible to produce a concept about Africa?”  In the middle of the sentence, the image cuts abruptly to a low contrast black-and-white shot of a girl drinking from a water fountain, in which the stereoscopy is deliberately misaligned, creating a ghostly double exposure effect. The water splashes up and hits her face, and then the shot changes to show her in colour, red hair, white sweater, setting up a bookstall in a public square. The film moves on. Whether or not it is the girl with the red hair who asks the question is unclear. In Forms of the Question, Nicole Brenez argues that Godard’s use of questioning draws on a combination of Socratic and Aristotelian models, where, frequently, the question is presented as a problem, usually constructed through montage, that is simultaneously, “polemical, prospective, and dialectical.”  In other words, it is a question that is critical of a situation, looks outward to the world and then proposes an alternative. She asserts, via Maurice Merleau-Ponty, that Godard’s questions are grounded in the knowledge that some things cannot be answered. “He didn’t know any more than they did. He only knows that there is no absolute knowledge and that it is by way of this absence that we are open to truth.”  The form of the question described above – its evocation of an idea of ‘the other’, the way it is spoken by a woman’s voice and addressed to a man, that it is accompanied by particularly beautiful images of nature and how it is left to be answered (or not) by what is to follow – suggests several problems regarding Godard’s use of the question and the way the ‘other’ is represented in relation to the tenor of the 21st century. This essay examines these concerns as well as asking what Adieu au langage reveals about being European and middle-class in the 21st century. To begin with Africa. Its image never appears in Adieu au langage, nor does the film include any African characters. However, Josette (Héloïse Godet) and Ivitch (Zoé Bruneau) have spent time there and it has left an indelible mark. For both it is a place of unsettling chaos, a space that is in opposition to that in which they now find themselves – the sleepy lush landscape of Rolle, where Roxy the dog finds in the long grasses and sparkling creek a sense of being in nature. From the images of tourists on a ferry and sitting in cafés, to the second-hand bookstands, iPhones and comfortable interiors, it is an overtly middle-class European landscape. To understand why Africa is present as “a concept” in Adieu au langage at all, it is useful to look briefly to Godard’s unrealised Mozambique projects and to the presence of African characters in Godard’s previous films. Sonimage proposed that Mozambique should take advantage of the country’s audio-visual situation to study television before it existed, before it flooded the entire social and geographical body of Mozambique (even in only twenty years). Study the image, the desire for images (the desire for memories, to show a memory, to make a mark, of departure or arrival, a line of contact, a moral/political guide, in the name of one goal: independence).  . While Michael Witt argues that these sentiments had developed in reaction to the overtly didactic approach of the Dziga Vertov work  , Manthia Diawara notes that Godard was prepared to go, like a missionary, into villages to train people. For me, this “white saviour” style of bringing emancipation from colonialism (which politically had already been achieved) through the adoption of a European-led ideology is problematic because it can be read as further colonisation through thought. Furthermore, Godard’s comments indicate a view of Africa as a blank slate where the white man might try out a supposedly “radical” project, and as a disordered space where his instruction could bring about a civilising influence. This is not to say Godard’s ideas were not interesting in relation to Mozambique’s unique position of being able to build a totally new media landscape, but the apparent approach, with Godard as founder (and leader of a new media movement) rather than consultant on an African led project is problematic. Furthermore, Daniel Fairfax provides some interesting perspectives that suggest Godard was at least to some degree aware of these issues. But regardless of his intentions, these statements demonstrate the difficulty of breaking free from a deeply entrenched colonial ideology in which a Eurocentric worldview has become naturalised. These two examples set the background for the way Africa is presented in Adieu au langage. From her sanctuary in Rolle, Ivitch describes Kinshasa. “In Africa you were coming out of what?” Marcus (Richard Chevallier) asks. “The silence,” she replies. The screen is black. “There are tons of sounds. There is war. There are animals. The silence arrives, then … another country. They’re at the door, speaking to you.” The conversation moves on to language. Something is happening with it, Marcus argues, our relationship to the world is changing. Ivitch responds. Soon everyone will need an interpreter to understand the words coming from their own mouths. The conversation takes place in the house, across a liminal space running from the stairs to the large wall mirror, in between the kitchen and living rooms. The sequence is one in which the stereoscopy splits – one camera follows Marcus as he walks from the stairs to a coat rack a few steps away, while the other holds on Ivitch, sitting on the stairs so that the breaking of sense occurs simultaneously in the image and the text. According to Witt, during the editing of Ici et ailleurs (Here and Elsewhere, 1976), (which began life as a Dziga Vertov project on Palestine titled To Victory) Godard and Miéville became increasingly attracted to the idea of silence as a response to issues they had previously sought to articulate through speech and sound. Godard had realised the problems regarding his earlier assumption that he “a militant Western intellectual, far removed from mortal danger and divorced from the daily realities of the Fedayeen […] had anything of value to say about or contribute to their cause.”  And, after noticing that the Dziga Vertov films had frequently recontextualised the image and drowned out the voices of their subjects via music and voice-over, began to advocate for “the revelatory potential of silence.”  Hence, a filmmaking style that frequently turned to voice-over to comment on, explain, and transform the image as well as to put forward ideas beyond those expressed in the montage, became one full of ellipses and unfinished sentences. With this in mind, one response to the question “How do you create a concept of Africa?” would be – with silence. Ivitch’s description highlights impenetrable silence as the binary opposite of too much noise, where both are equally unintelligible. But, where the language stops, the image continues to speak, and in Adieu au langage, some of the most memorable images are those of the beauty of the landscape where Roxy and his humans play. Shortly after Ivitch speaks of Kinshasa there is a sequence of such natural beauty, where the camera roves across a field of poppies and through sunlit grasses, similar to those that accompany the question with which I began, “Sir, how do you create a concept of Africa?” It is against this backdrop of a nature that is green and peaceful that we imagine Kinshasa as a place of noise and war. The problem: Kinshasa, former property of Belgium’s King Leopold II and currently one of Africa’s largest urban areas, is not exactly the dusty, undeveloped space one might imagine from Ivitch’s description. This is not to say the city is without postcolonial scars, but its reality, and the cinematic image of it created by its own filmmakers  , is far less terrifying and far more complex than Ivitch’s description suggests. This renders her concept of Africa, an imaginary, generically chaotic Other space . It is the opposite of Rolle, which is identified through specificity as a place (in Michel de Certau’s terms), its identity formed and developed through the film’s images. Further accentuating this idea of a generic “other space” in this section is the image of some artifacts sitting on the window sill. 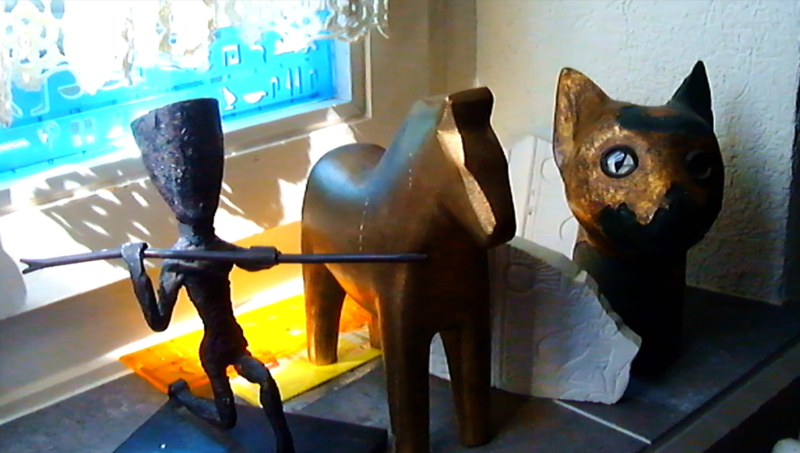 A rough figure with a spear, a wooden horse, a rough cat’s face. They are inserted into a scene of an argument in the bathroom, immediately after Ivitch says “We said, no more war.” Beyond the figurine’s literal gesture – spear raised – the artifacts could be seen as colonial spoils of war re-situated in Rolle as decorative possessions. As with Diop’s presence in La Chinoise, in Adieu au langage Kinshasa stands in for the Western image of Africa as it was disseminated across the West in the 20th century – first through colonisation and then through the media. Later, she recites a story from the camps of World War II, a story that is not hers, from a time before her. She repeats like a lesson. “When he entered the gas chamber, a child asked, ‘Why?’ to his mother. An SS officer shouted, ‘No whys!’” The shot is framed so that Josette, close up and in the foreground, looks out past the camera. Gedeon stands behind her, and he feels far away, not only through the depth created by the 3D perspective, but because he is out of focus and cut mostly out of frame, his shoulder taking up most of his space. Further beyond and in focus so soft as to turn his shape into an impression of colour, is Gedeon’s reflection. They are standing in front of a mirror. In between these two conversations that circle around a far away other, there are shots of quiet domesticity. Roxy plays in the fields, Josette dresses in front of the television. Taps are turned off. Washing is put into the machine. Outside, the world is consistently beautiful, nature at peace. But a pressure hangs over their relationship, in the canted camera angles, in the way the bodies seem always to not fit into the frame. They struggle, one with the other, to find an equilibrium. 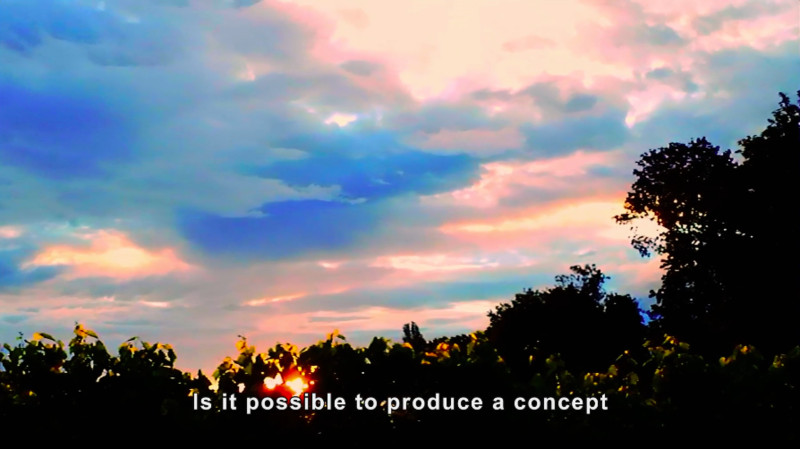 To return to Brenez’s “Forms of the Question”, they speak in the form described as “Home-movie version: The Conversation”. In these conversations, she writes, two people speak alternating lines of dialogue, and “the variants develop according to the forms their presence takes in the dialogue.”  This, like the silence, allows for ellipses and leaps. Gedeon insists the toilet is the only place where people are equal, Josette responds with the announcement that she is going to die. What does Josette’s invocation of the camp amid a middle class, domestic life tell us about the way this image has become absorbed into the thread of a contemporary, everyday life, one that is removed from the camp’s physicality but haunted by its presence? In Means Without End: Notes on Politics, Giorgio Agamben describes the camp “not as a historical fact and an anomaly that – although admittedly still with us – belongs nonetheless to the past, but rather in some sense as the hidden matrix and nomos of the political space in which we still live.”  This is perhaps even truer in the 21st century than it was in the mid 1990s when the essays that make up the book were written. Furthermore, for those outside the camps, images of the camp – in particular the refugee camps, the offshore detention centres set up on Nauru by the Australian Government and those related to the “war on terror”, like Guantanamo Bay – have become, alongside the images of terror and celebrity, the defining images of contemporary life. Agamben notes that the camp of World War II is not quite the same as the camp of today, but Godard is essentially a 20th and not a 21st century filmmaker; in light of this, I am taking his image of the camp to stand in for the idea of the camp in general. Josette recites the story of the camp in a mechanical voice that seems to come not from her but from elsewhere. Throughout his work, Godard has played with the idea of the body as a conduit for history that performs or re-performs the gestures of some collective unconscious. This is frequently physicalised in the performances of the actors. As Hamish Ford notes in relation to 2 or 3 Things I Know About Her (1967), the character of Juliette (Marina Vlady), a mother, housewife and part time sexworker, recites lines that do not seem to fit her character, resulting in an “almost disembodied mouthing of lines that are clearly not her own”. The absent physicality that makes Vlady’s performance both hypnotically robotic and strangely vulnerable – she has given herself over completely to a voice – is seen again in Éloge d’lamour (2001), where two young actors walk through the roles they will play in an unmade film. The surface nature of their gestures, performed from the outside, make them feel worn rather than inhabited . Agamben acknowledges the subjective nature of how we think and then moves beyond it. The question of why will always be unanswerable because subjectively, no one can imagine how. Hence, a question like Godard’s will not produce any worthwhile avenues. However, when reframed to put the way societies work as collective administrative bodies at the centre of the investigation, possibilities for exploration, discussion and ultimately, structural reform or change, open up. Furthermore, once it has been established that those in the camps have become “pure biological life” through a set of administrative decisions rather than because they are inherently non-human (the total other) it becomes possible to imagine their voices being reinstated, and ultimately their rights. Of course, there is the problem that runs deep in Adieu au langage, of sets of experiences being so different as for them not be understood by each other. But I would argue (against Ivitch’s claim that soon we will no longer understand each other) that, in the 21st century, the inability for us to accurately feel the Other does not necessarily lead to a stalemate of incomprehension and paralysis. Within a 21st century conception of being and identity, we can, after the silence of acknowledging that one cannot speak for another, allow the other’s voice to continue, and in response, follow the other’s actions, leading to a new, more equitable form of speech and action. In the 21st century, Godard’s question, “Sir, is it possible to produce a concept about Africa?” is also the wrong question because it is asked by the wrong person, framed around a 20th century model of the Westerner speaking on behalf of the other. The question can only result in a fruitful answer if it is asked and answered by Africans. From there, rich perspectives open up, and whether or not they can be understood by the Western other, is not the primary concern, because a contemporary concept of Africa is one that can only be led by Africans. And yet, these failings on the part of the film’s philosophy combined with the richness of the image of Rolle, reveal something very true about the intellectually chaotic and anxious nature of how it is to live as a comfortable, middle class person in the media landscape of the 21st century. As the early scenes in the film, where characters Google things on their iPhones, demonstrate, information from a distance is something accessible to almost everyone in the Western world, and information about war at a distance is social currency in middle class life. But what are we to do with this information, the steady trickle of destruction and imaginative affect that is at stark odds with the comfortable physical sensation of our daily lives? The film’s central characters seem either distressed or paralysed by this inner disjuncture. There is a current of anxiety that runs through their voices and their stories, through the endlessly flickering widescreen television and their nervous domestic gestures. Adieu au langage’s ultimate response seems, via Roxy, to be a return to nature. As the animal other, her experience is beyond the humans’ grasp, but her actions, her way of being in the world, are a lesson. Roxy is connected to the seasons, she lives within the world’s material qualities for their own sake. The touch of the water, the rocks, the grass, the dirt. 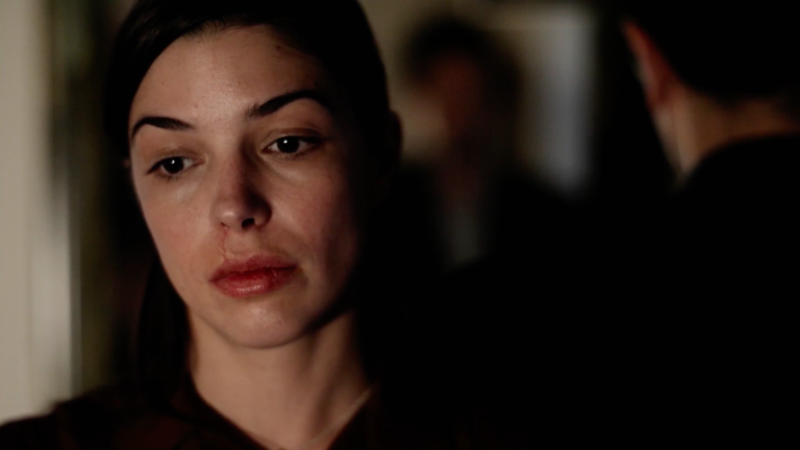 Brenez has likened Godard’s late films to the work of Jonas Mekas, and while Mekas has a very different interpretation of the world and sense of being in it to Godard, in Adieu au langage, the low-fi diary-like sequences of Roxy’s walks have a strong kinship with Mekas’ videographic observations, which show an intimate world that is joyfully physical, tangible and grounded, against the background of the wider political tenor. 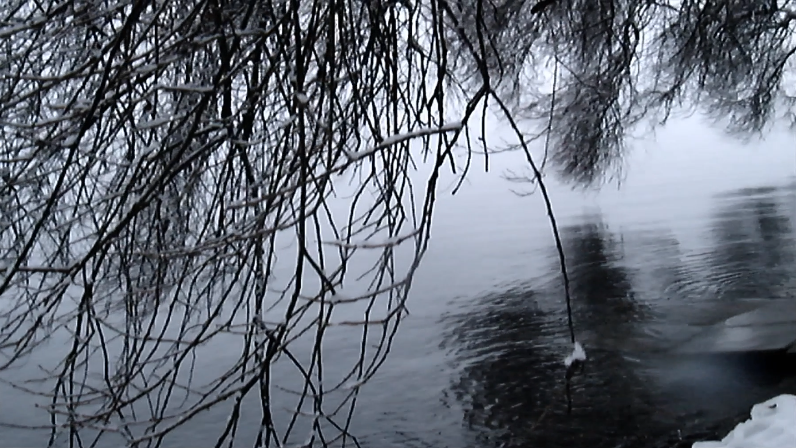 In Adieu au langage, the intimate is given further solidity through the 3D image, and it is in the truly small gestures, hands being put into a pool of water, snow caught on branches, quiet clouds, that a very real sense of the world comes into focus. Godard’s obsession with the perspective and weight of painting seem suddenly in reach. His 3D brush creates a sense of volume that is different but akin to the volume of paint. Like Godard’s beloved Pierre Bonnard, whose close intimate compositions are referred to more than once in the film, Adieu au langage presents the present moment as it exists in Rolle, with quiet natural beauty. As Julian Murphet points out, the question is quoted from Jocelyn Benoist, Concepts: Introduction à l’analyse ; however, as Godard recontextualises quotes as dialogue, I take the question as it sits in the context of the film. Nicole Brenez, “Forms of the Question”, in Forever Godard , eds. Michael Temple, James S Williams, Michael Witt (London: Black Dog, 2004), p. 163. James S Williams, Encounters with Godard: Ethics, Aesthetics, Politics (New York: Suny Press, 2016), p. 45. Quoted in Jerry White, Two Bicycles: The Work of Jean-Luc Godard and Anne Marie Miéville (Ontario: Wilfred Laurier University Press, 2013), p. 50. Michael Witt, “On and Under Communication”, in Companion to Jean-Luc Godard , eds. Tom Conley and T. Jefferson Kline (Somerset: Wiley-Blackwell, 2014) pp. 319-321. Manthia Diawara, “Sonimage in Mozambique”, in The TVideo Politics of Jean-Luc Godard , eds G. James and F. Zeyfang (Berlin: B. Books), pp. 92-121. Daniel Fairfax, “Birth (Of the Image) of a Nation: Jean-Luc Godard in Mozambique”, Acta Univ. Sapientiae, Film and Media Studies , Vol. 3 (2010), pp. 55-67. Williams, Encounters with Godard , pp. 35-36. Witt, “On and Under Communication”, p. 321. Brenez, “Forms of the Question”, p. 170. Giorgio Agamben, Means without End: Notes on Politics (Minneapolis: University of Minnesota Press, 2000), p. 37. Agamben, Means without End: Notes on Politics , p. 39.